Woodard Cleaning & Restoration continues to help people get back to their lives. Shortly after the team returned home from helping the communities affected by Hurricane Florence in North Carolina, the team quickly deployed to Florida to help those devastated by Hurricane Michael. 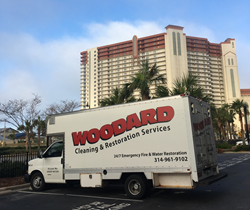 Woodard aids partner company in the restoration of a 700 unit timeshare in Panama City, Florida. Our partners are a huge asset in helping us hit our long term goal of helping one million people get back to their lives. Before the hurricane made landfall, Woodard already had boots on the ground in the Panama City area preparing for the damage that would be left by Hurricane Michael. The rest of the Large Loss Catastrophe Team (including Project Managers, Site Administrative, and Crew Chiefs), soon followed with additional supplies, years of expertise, and an eagerness to being working. One of Woodard’s partner companies in Panama City had a call come in requesting they extract and dry out a 700 unit timeshare located right on the beach. They arrived on scene and began work right away. Due to the severity of the job, our partner company reached out to us to come assist in the mitigation. Our team quickly arrived and began removing the wet contents and drying out the units. “We have strategic partners located across the county. When disaster hits, they reach out to us so that we can provide assistance to areas in need of additional restoration services. said Dave Christoff, Chief Revenue Officer. When St. Louis experiences a natural disaster, such as flooding, we often call on our strategic partners to step in and help us. “Our partners are a huge asset in helping us hit our long term goal of helping one million people get back to their lives.” continued Christoff. Woodard crews were deployed for about a month as they went room by room mitigating the damage ensuring that each unit was properly dried. Despite the hard work and long hours, the team still made time to have some fun. In the evenings they would go out to eat at local hot spots as a team, cooked teams dinners in, and hosted the 1st Annual Chili Cook-Off! On October 30, 2018 our team returned home. Our partner company shared with us that they could not be happier with the works our crew completed. Thank you Panama City for allowing us to help your community after Hurricane Michael! 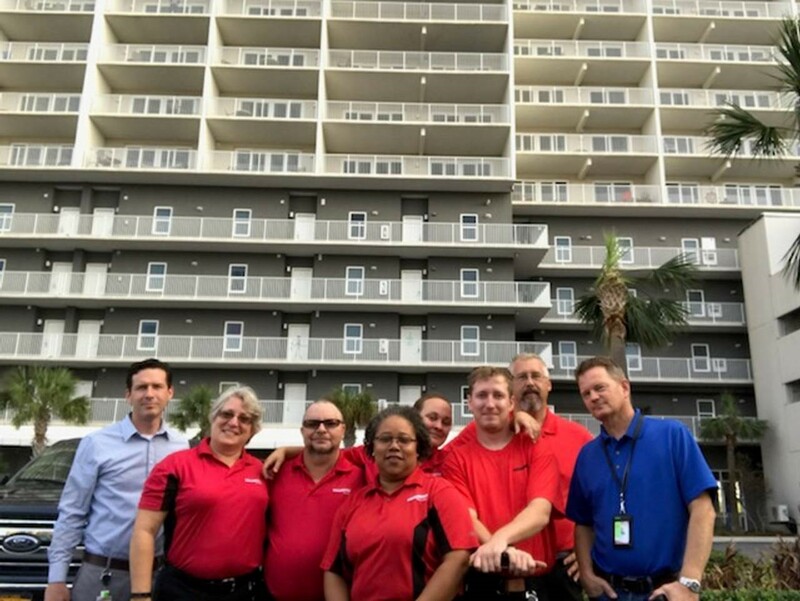 Part of Woodard's Large Loss Catastrophe Team on site in Panama City, Florida.Part of Woodard's Large Loss Catastrophe Team on site in Panama City, Florida.